US President Franklin D. Roosevelt addressed Congress on the State of the Union on January 6, 1942. He called for building 125,000 aircraft and 75,000 tanks in 1943. He also called for national unity, patience and fortitude throughout a conflict that looked like it had no end. 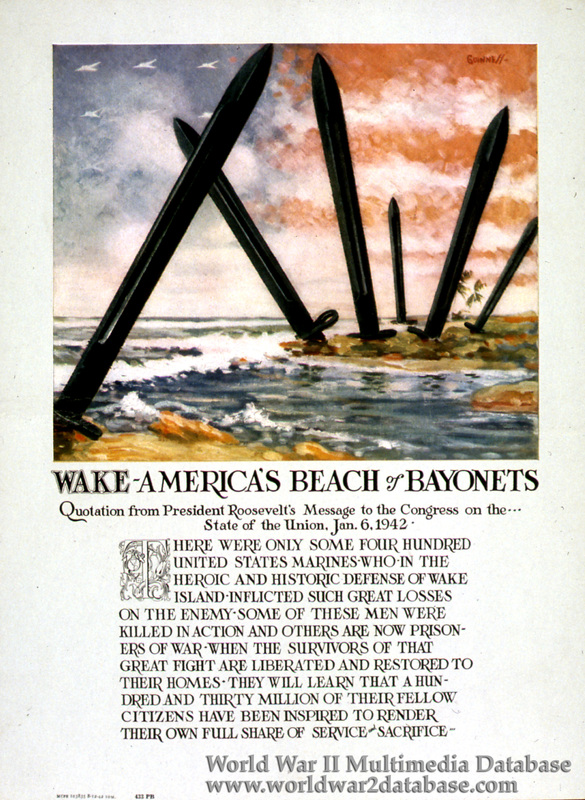 He cited Wake as a heroic battle, saying: "There were only some 400 United States Marines who in the heroic and historic defense of Wake Island inflicted such great losses on the enemy. Some of those men were killed in action; and others are now prisoners of war. When the survivors of that great fight are liberated and restored to their homes, they will learn that a hundred and thirty million of their fellow citizens have been inspired to render their own full share of service and sacrifice." With a public desperate for good news, Wake was held up as a shining example of defense, and entered the public consciousness as a symbol of defiance. The Battle of Wake was the only time an amphibious invasion was repelled during the war. Poster by Office for Emergency Management, Office of War Information, Domestic Operations Branch, Bureau of Special Services. Released on August 10, 1942.